Events like the World Cup and the Olympics kickstart a festival of patronage and allow authoritarians to seem beloved on the world stage. Enough is enough. When Russian President Vladimir Putin stepped up to the podium at the opening match of the 2018 World Cup, he assured the world that Russia is “an open, friendly and hospitable country.” Never mind that Russia has a notorious record of racism and homophobia and that Human Rights Watch has asserted that we’re in the midst of “the worst human rights crisis in Russia since the Soviet era.” Not only was Putin brazenly prevaricating, he was also tapping into the trend among authoritarians to “sportwash”— using mega-sports events to launder their reputations and distract from their horrific human-rights records. Putin has basked in the warm international glow generated by the World Cup. On the eve of the event, he stated, without irony, that he “wanted to underline FIFA’s commitment to the principle of sports without politics.” And yet at the opening match, Putin packed his luxury box with political leaders, including dictatorial glitterati like the Crown Prince of Saudi Arabia Mohammed bin Salman, senior North Korean official Kim Yong Nam and the president of Azerbaijan, Ilham Aliyev. 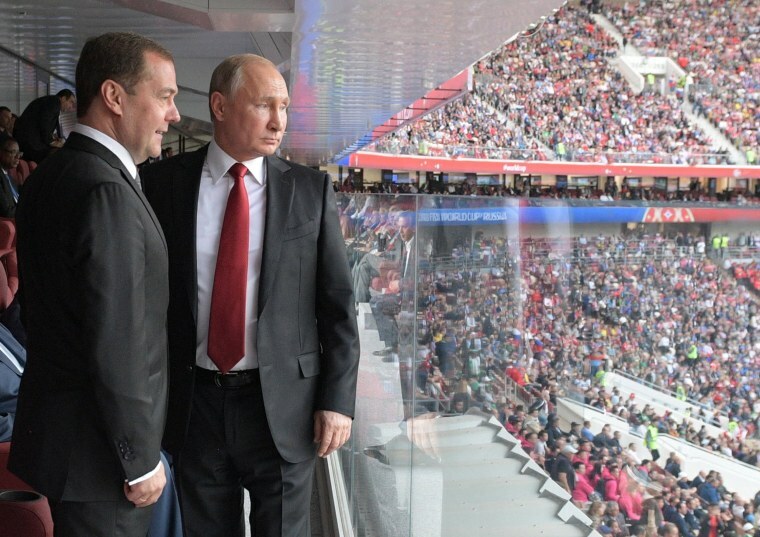 At the opening match, Putin packed his luxury box with political leaders, including dictatorial glitterati like the Crown Prince of Saudi Arabia Mohammed bin Salman, senior North Korean official Kim Yong Nam and the president of Azerbaijan. Putin was also joined by Alexander Lukashenko, the longtime dictator of Belarus who surely was taking mental notes. With all eyes on the World Cup, Lukashenko is quietly orchestrating another frenzy of “sportwashing”: the European Olympics, which he will host in Minsk next summer. The games are slated to commence on June 21, 2019 and will run through the end of that month. The European Games, a sort of mini Olympics for Europe’s athletes, is building a hideous tradition. The inaugural installation of the games took place three years ago in Azerbaijan, another human rights nightmare. Yet it’s not too late to reverse course and pluck the games from Lukashenko’s clutches. Last year, human rights groups successfully pressured the International Olympic Committee to add human rights principles to its host city contracts. If these provisions mean anything, the IOC must intervene to cancel the 2019 European Games in Minsk. This would be a bold, unprecedented act and it would also send a clear message about the Olympics’ publicly proclaimed concern for human rights. In March, activists rallying for “Freedom Day” — and against Lukashenko’s iron-fisted rule — were arrested and jailed. The irony became even more apparent last year when heavily armed riot police attacked “Freedom Day” protesters with batons and water cannons while the internet was shut down. More than 1,000 were arrested in those 2017 protests. This followed the questionable arrests of more than 30 authors, journalists and publishers, with many snatched by masked police at a literary festival. Belarus is also the only country in Europe still clinging to the death penalty. Last month a UN special rapporteur described the treatment of death row inmates as torture. In 2012, Britain rejected granting Lukashenko a visa to attend the Summer Olympics in London. One could argue that the European Olympic Committees had little choice but to team up with Belarus. Time was getting short and potential hosts were dwindling. In May 2015, the Netherlands were named host of the 2019 games, but then the Dutch government yanked its financial support leaving organizers in the lurch. A lack of options does not mean the International Olympic Committee or European Olympic Committees should smash their newly found moral compasses. That’s when Russian Olympic honchos stepped in, offering to host the games in Kazan and Sochi, the latter city notorious for hosting the 2014 Olympics, which cost more than all previous Winter Games combined. But after a special report from the World Anti-Doping Agency unearthed a systematic doping program in Russia, this option also became untenable. All this points to a larger problem, however: Fewer and fewer cities are keen to host the larger Olympic Games, let alone the European Games. Still, a lack of options does not mean the International Olympic Committee or European Olympic Committees should smash their newly found moral compasses. The Russian World Cup is already almost over and as such the damage has been done. But that doesn’t mean other mistakes can’t be avoided. After all, by awarding the European Games to appalling human-rights violators, European Olympics luminaries are making a mockery of the Olympic Charter, which the European Olympic Committees claim to abide by. Unlike the global Olympics, which has been called off only a few times in its 100-year-plus history — usually due to massive international conflicts — this is only the second iteration of the European Games. As such, there is still time to prevent Lukashenko from posing for a series of grin-and-grip photo-ops with Europe’s cosmopolitan elite. It’s not as if the event has a long and storied history that absolutely must continue for the sake of tradition. If there ever was a time to make a statement, it is now. Of course, international observers are not holding their breadth. Ultimately, this pattern reveals a shameless penchant for selective ethics at the highest levels of the International Olympic Committee and FIFA, the world’s governing body for soccer. When sport medals trump moral mettle, we’re on a perilous path. FIFA has punted to Putin. Time for Olympic officials to show some spine: the 2019 European Games must not go on. Jules Boykoff teaches political science at Pacific University in Oregon. He is the author of three books on politics and sports, most recently "Power Games: A Political History of the Olympics." Follow him on Twitter at @JulesBoykoff.